Ok so I’m not sure why I’ve decided to try my hand at these little beauties, considering I have never tasted one myself…there’s a lesson to be learnt there. Anyways I was set the challenge by my boss to make the small buttery little cakes called Madeleines, a french classic (gulp!) and referenced by Marcel Proust in In Search Of Lost Time ( gulp gulp! ), added to the fact that pretty much every recipe I found suggested that this was one not for an inexperienced cook.. what was I thinking !! So I searched for a relatively easy recipe, and that’s when I stumbled across a book simply title We Love Madeleines by none other than Miss Madeleine! Hurrah!! This sweet little book is packed full of recipes just of madeleines, chocolate, caramel, lemon, spicy and savoury , naturally I opted to try the basic madeleine. I’ve tried this recipe twice now , and it’s super easy and makes about 12 (maybe few more)….and just yummy with a cup of tea. 1. In a bowl sift together the flour , baking powder and salt. 2. In a stand mixer fitted with a paddle attachment , beat together the eggs, egg yolk, granulated sugar , and vanilla until the the batter until thick enough that it falls into a slow ‘ribbon’. Firstly I don’t have a stand mixer , so I used a food processor with a beater attachment , but I think you could also use a hand whisk. Secondly, the ‘ribbon’ stage is when you can hold the beater up slightly and the batter falls off the beater into a slow stream and forms a sort of ribbon on top of the rest of the batter and then disappears. 3. Gently fold in the flour mixture until just combined. 4. In another bowl , whisk 1/3 of the batter into the melted butter until just combined, then add back into rest of the batter and let it stand for approx 1 hour. 5. Pre heat the oven to 180C/ 350 or gas mark 4. 7. Pipe the batter into the moulds, approx 3/4 full and bake for 8 – 10 mins. 8. 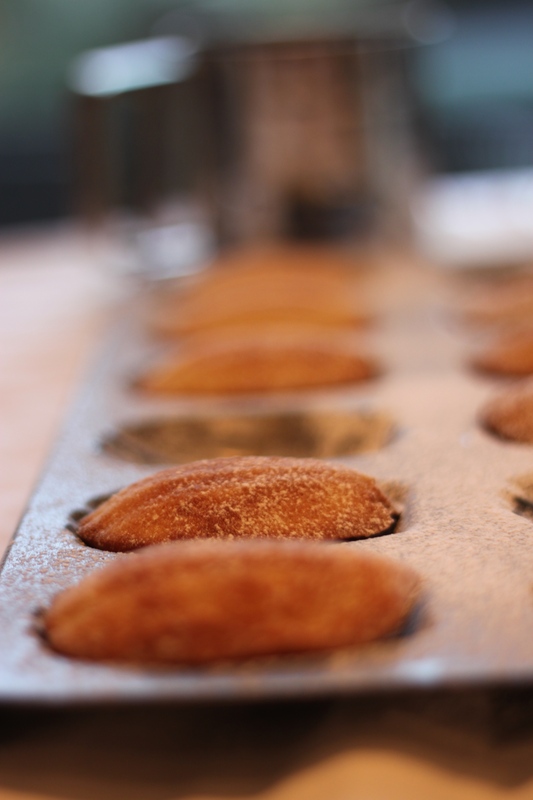 Immediately turn out the madeleines onto a wire rack and let cool. Dust with icing sugar and enjoy with a cup of tea. What you lookin' at fool! Nice recipe. I’m thinking of having a go but don’t have a stand mixer fitted with a paddle attachment, however I do have an electric drill that I could attach a spatula to and use that as a makeshift mixer. Do you think that would work? By the way, I think Sweet Madeleine would be a fine name for a pirate ship. Or maybe a song by Neil Diamond. Thanks for the lovely comments. With regards to using an electric drill, I would steer clear of that idea. If you’re anything like me and incredibly clumsy you’re likely to end up in A&E for the afternoon rather than enjoying a nice cup of tea and piece of cake so I would try and get hold of an electric whisk if you can. I agree Sweet Madeleine would indeed be a fine name for a pirate ship!